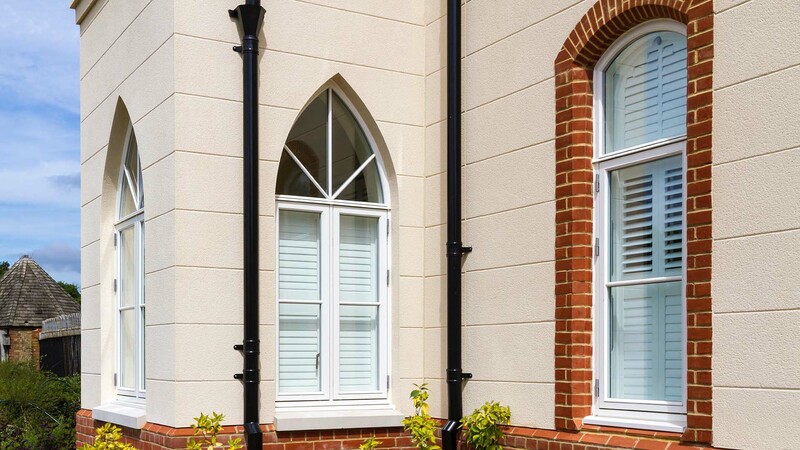 High performance monocouche render from Weber has been specified for recent new-build properties at St. George’s Park Retirement Village in Burgess Hill, West Sussex. The new buildings will provide extended accommodation for the retirement community established and run by Augustinian Care which is set in 250 acres of glorious parkland and gardens. The buildings are finished with weberpral M, a one-coat, through-coloured external decorative render. An elegant ashlar architectural detail has been used to underscore the traditional aesthetics required to blend perfectly with buildings already established in this community. The project was designed by award-winning PRP Architects, with practices in London, Manchester and Surrey, who undertook the original brief for the St. George’s Park Retirement Village. PRP Architects specialise in designing high quality buildings that enrich the lives of users and their communities. The main contractor, Galliford Try Building, is very impressed with the weberpral M decorative render noting that it is a high quality material and that the application work carried out by Complete Rendering Systems was first class and has given the very best possible finish for St George’s Park. weberpral M, a one-coat, cementitious, through-coloured render, is suitable for application to most brick and block work substrates. It is factory produced from carefully selected raw materials for consistency and supplied ready-mixed requiring only the addition of clean water on site. It is formulated for pump application which makes for quick and efficient installation, contributing to shorter programme periods, reducing associated scaffolding and site costs and permitting the completion of ground works at an earlier stage. weberpral M has excellent weather resistance and durability whilst allowing the structure to breathe. 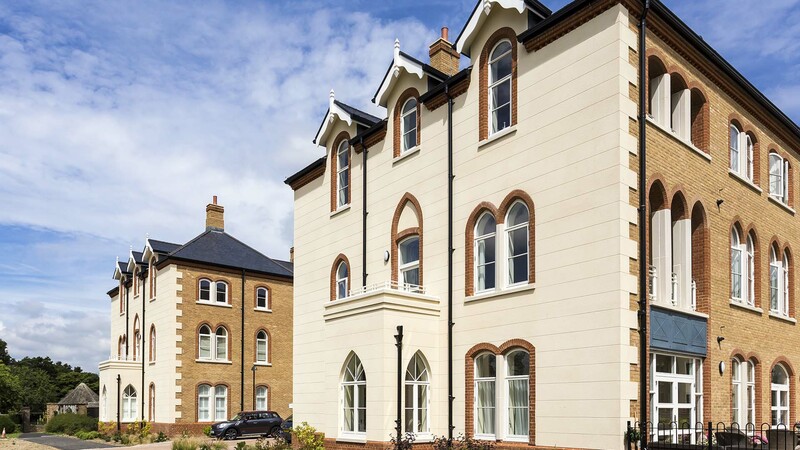 The through-coloured render requires no decoration, is truly low maintenance and offers a variety of ways to achieve distinct architectural features. On the St George’s properties ashlar patterns have been applied. weberpral M is applied in a two pass operation to a thickness of 20-28mm and then scraped when green giving a minimum render thickness of 15 to 25mm. When set but not fully hard, the ashlar detail is cut into the render ensuring that a minimum of 15mm is left at the base of any cut. The through-colour characteristic of weberpral M ensures that the overall colour aesthetic is maintained even in the deepest recess. 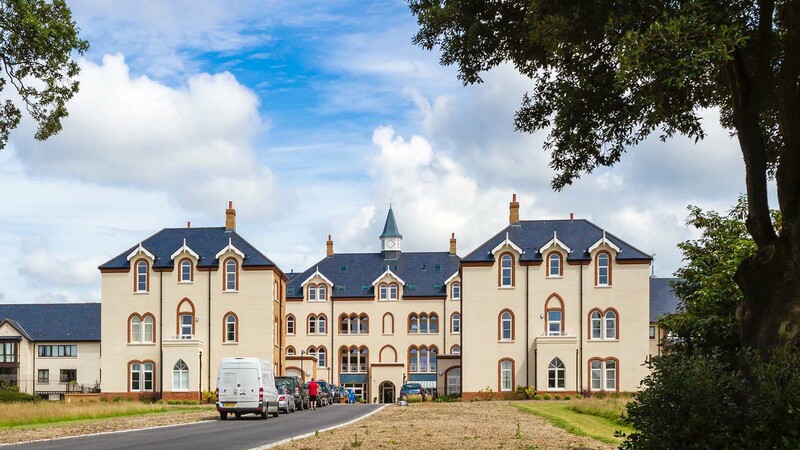 St. George’s Park Retirement Village is located on the site of the original Retreat that was the first home established by the Sisters of St. Augustine when it was re-formed in 1866, principally to care for the mentally and physically ill. The Sisters have continued to care for those that need it ever since in several care facilities in Sussex.